There are many advantages to being a food blogger. In my first year of blogging, Dave and I did not eat the same meal twice. Since then I have discovered a whole lot of new flavours and recipes, and met the most amazing people, both in real life and over the internet. However, there are some disadvantages as well. Recipes will call for the smallest amount of ingredients and you end up with a pantry and fridge full of the strangest items. I still have oats left over from making haggis and Sunday nights are usually reserved for using up the odds and ends in a pasta sauce. The other day a recipe called for 90mls fresh cream. I went out and bought a 250ml tub of cream and used what the recipe called for. Before I could get to using the rest of the cream it had turned sour. Now, crème fraîche is a great ingredient, and soured cream is not too bad, but sour cream is just not that useful. Well, that was until I decided to make home made butter using my sour cream. The irony is that the best way to make the butter is to use equal amounts of sour cream and fresh cream. For testing purposes I have made butter using equal amounts of fresh and sour cream, using my left over sour cream and a full tub of fresh cream and fresh cream alone. All the results were great. And at least this way, I am turning my sour cream into something very useful! Making your own butter is so rewarding, and you get to control the salt level. You can use an entire tub of fresh cream if you do not want to waste any, or less if you have that to hand. Reminds me of when I was an apprentice chef. I was whipping cream for 1200 dessert plates. I swear I turned my back for 2 minutes and bam…. it was butter. Allllll the trouble I was in that night. LOL! oh my, what a waste of time! Delish! I will remember your recipe for next time I have sour cream we need to use up. I bet this is awesome on potatoes. Oh Tandy, you know the way to my heart don’t ya girl :). I LOVEEEE BUTTER. Sorry for the caps but I do lol. What a great idea! I’ve never thought to make my own butter. WOW!! This is so great!! Lovely recipe!! I used to LOVE butter when I was little… haha 🙂 very sentimental! Wow Tandy, this just sound and look fabulous…so simple…it is a great idea to use up the sour cream. 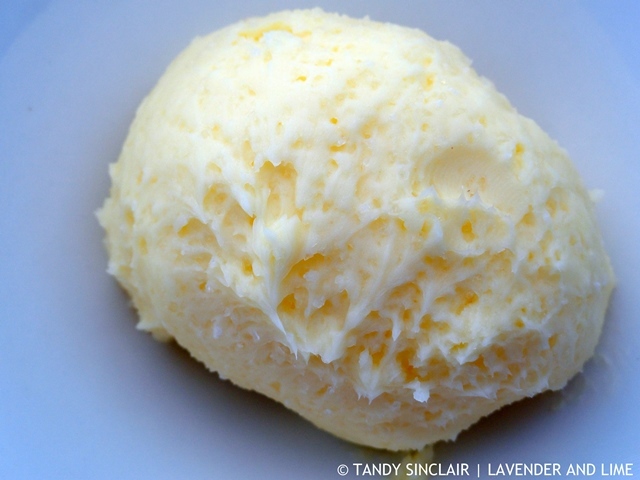 Oh, lovely – homemade butter – delicious! Thanks Tandy! 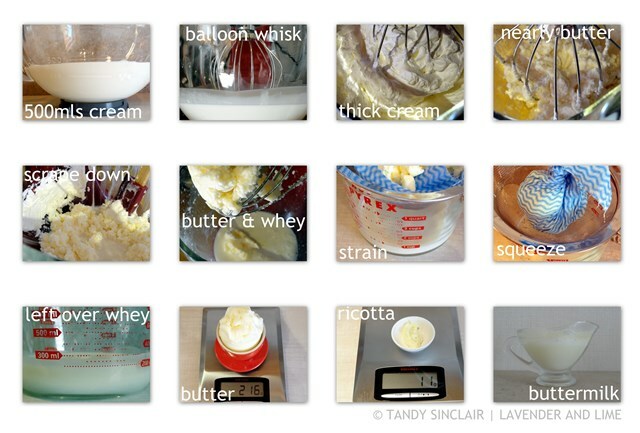 I keep meaning to try to make my own butter – how long roughly does it take to turn from cream to solid? I never realized butter was so easy to make!